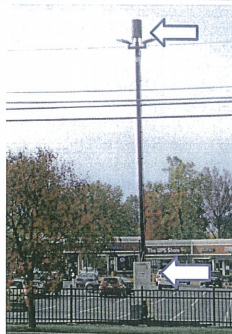 A zoning text amendment that would permit small cell towers to be installed on any structure 15' or higher in the City of Rockville is sailing towards a decision by the Planning Commission next Wednesday, unless the Mayor and Council intervene Monday evening. The staff recommendation is that commissioners recommend the Mayor and Council approve the ZTA, but reduce the allowable size of the antennas from 2x4.5' in size to 2x3'. Yesterday, the West End Citizens Association sent a letter to the Mayor and Council asking them to halt the approval process until the public can be officially informed of the proposal and data on the health impacts of cell towers. Noreen Bryan, President of WECA, wrote that City staff scheduled the May 11 commission hearing, and a June 6 Mayor and Council hearing, before alerting the public to the issue. Simply using the Rockville Reports newsletter to inform residents after the hearings was not sufficient, Bryan wrote. "I believe that staff has overstepped its authority, has acted in a way that is adverse to protecting the public and has failed to allow citizens to participate in the issue by failing to notify themof the text amendment," she wrote. Bryan urged the Mayor and Council to cancel the public hearings at their next meeting this coming Monday, to gather the available research on the health impacts of cell towers, and to then formally report that information - and the ZTA itself - to the public before holding any hearings. In previous written comments submitted to the City, Bryan expressed concern that these small cell towers could wind up on many utility poles in residential neighborhoods, and that the low altitude of the towers would increase ground-level radiation. She also noted that the ZTA language would give the Board of Appeals power to allow antennas larger than the proposed 2x3'. The applicant is Cellco Partnership, doing business as Verizon Wireless. Cell towers could not be installed on single-family homes under the ZTA as currently written.